Background: Plant parasitic nematodes are dangerous pests that damage various agricultural crops and decrease their productivity. Objective: The resistance of new lines of wheat (Triticum aestivum L.) plants obtained under in vitro conditions on MS media containing microbial bioregulators to plant parasitic nematodes was studied under in vitro and greenhouse conditions. Methods: Here we conducted physiological and molecular-genetic studies of resistance of wheat plants to nematodes. Results: In vitro experiments showed that wheat plants grown on MS media with microbial bioregulators had 20-37 % of infestation with cereal cyst nematode Heterodera avenae, significantly lower when compared with 73 % of infestation of the control plants grown without bioregulators. Bioregulators increased morphometric parameters of the wheat plants obtained under in vitro conditions on MS media and further grown under greenhouse conditions on the natural invasive background: stem height increased 13.6-37.5 %, flag leaf length 18.0-19.3 %, ear length 6.8-24.6 %, and ear weight 27.0- 54.5 %, when compared with control wheat plants. 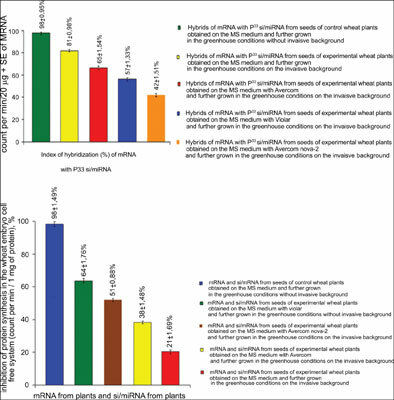 The difference in the degree of hybridizated molecules mRNA and si/miRNA from control and experimental wheat plants increased: 15-39 % in plants grown under in vitro conditions on the invasive background created by H. avenae and 33-56 % in seeds of plants grown under greenhouse conditions on the natural invasive background. The silencing activity of si/miRNA from wheat plants grown on MS media with bioregulators increased: 20-51 % in plants grown under in vitro conditions on the invasive background created by H. avenae or 38-64 % in plants grown under greenhouse conditions on the natural invasive background. Conclusion: Our studies confirm the RNAi-mediated resistance to plant nematodes of wheat plants obtained on media with microbial bioregulators and grown under in vitro and greenhouse conditions. Microbial bioregulators, wheat, plant nematodes, si/miRNA, RNAi-process, mRNA.